The Common Ground community believes that praying together is an important part of every person's journey, regardless of our situation, and that praying for each other is essential for a good community. Members of Common Ground take turns preparing and leading the Morning Prayer program. Church of the Common Ground meets twice a week for Morning Prayer, on Mondays and Wednesdays from 11 a.m. to 12 Noon at Central Outreach (201 Washington Street, Atlanta) by Talmadge Park. Hospitality and fellowship coffee time begins at 10:30 a.m.
An important part of Morning Prayer is hospitality. 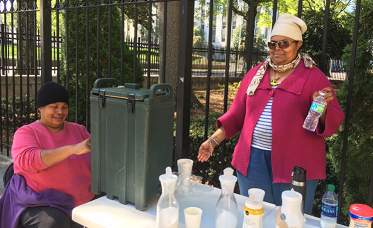 Members of Common Ground serve others on the streets hot coffee and a smile. Like any church community, the coffee hour allows everyone to talk with each other about life, about what's happening, and to grow more connected. Many churches and groups collect and donate coffee, creamer and sugar in support of Common Ground's hospitality. To donate items, visit here.